Shelley Bean: Design Team Blog Hop! A quick note before I start off the blog hop...there has been some confusion about challenges we issue as the Design Team. So, let me clarify. Challenges are open to everyone. You are not required to use rubber stamps in your entries. You can use any creative tools that you like. We only ask that you follow the theme suggested. We also ask that you enter only 1 time. If you have more designs that you would like to share with us, we welcome you to upload them on the facebook page. I LOVE seeing what others are creating. So...without further ado....let's start the hop!! Hello! You have arrived at the Heartstrings Design Team Blog Hop! Yay!! You are in for a treat because not only are there some fun projects to take a look at, but there are also some free giveaways to enter. Not only on this blog...but as you hop along, you will find some more! Our theme is "Fun in the Sun". We utilized stamps from our very wonderful sponsor, My Heart Stamps For You...and using our varied imaginations....made something unique and wonderful to share. But, that's not all...we also want to invite YOU to create right alongside of us. After you have hopped through all the blogs, come back here to enter our Challenge!! We would love to see what YOU can create that follows our theme. The challenge will run until July 18th...so you have a little time to get crackin'! If you decide to join our current challenge and share with us your "Fun in the Sun" inspired cards, layouts or creations, you will become eligible for the most amazing prize! One lucky (randomly drawn) winner will receive a FULL sheet of rubber stamps from our sponsor, My Heart Stamps For You. This is a tremendous opportunity. The entire sheet, ready to mount (with mounting foam I will personally include) will include all these images! Now it is time to hop over to Mariam Satchell and see what she has to share! (hop...bunny...get it?) Don't forget to hop back over here when you have visited the last one and join us in the challenge. I can't wait to see what you create!! Love your card, makes me miss gardening and than I think of all of the canning I used to do, wow that was a lot of work, I think I will just enjoy your card. Love this card! Super cute and the coloring is fabulous. I almost used this stamp. Love the giveaway! 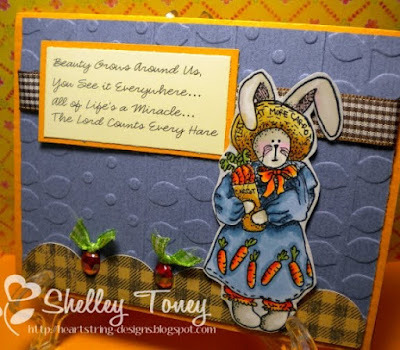 Shelley, so I see we both like to garden:) Your card is so cute. I just love the way you color your cards. You are such an inspiration to me. Awesome! I love this card... and I would have never thought about the "Bling" and ribbon used as carrots. Sooo cute!! I found this Blog Hop from Gaby's blog over at Scrapbookaholic blogspot... I love it when I find new talented people to follow. Thanks for the possible goodies. FUN!! Adorable card, and I love that texture plate you used! I LOVE this card! The bling carrots is brilliant! I have never gardened, but I think I will enjoy it :) Awesome coloring!!!!!!! The giveaway is superb! starting to hop now... does this count as exercise?? ?